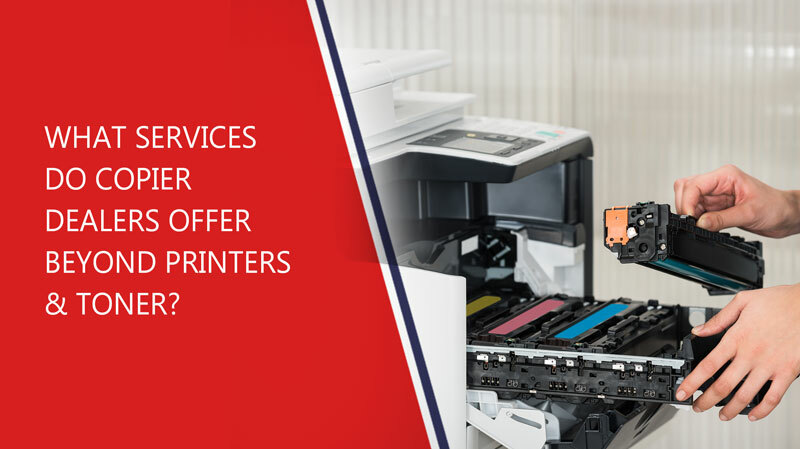 What Services Do Copier Dealers Offer Beyond Printers & Toner? At first glance, it might seem like copier dealers are in a tough industry. The development of paperless workflows, increasing digitalization, and overall reduction in printing should be bad news. The truth, however, is exactly the opposite. Copier dealers are doing better than ever and it is due to exactly the same factors. The difference is that instead of trying to convince office managers to print more, dealers are helping them print less. One of the most popular ways printer dealers help businesses reduce costs is by offering managed print services. MPS offers businesses the ability to outsource printing processes to a vendor who can handle low-impact print-related tasks at a lower cost. Reduce Consumable Use. Managed print services allow offices to take control of their print processes. Print audit and monitoring software allows administrators to exert control over employee printing, keeping it in line with clearly defined print policies. Lower Energy Consumption. Reducing the amount of printing also reduces the amount of energy the average office dedicates to printing. Also, managed print expertise offers data that office managers can use to dedicate higher-volume, higher-consumption print equipment to busier departments, resulting in a net reduction in energy and consumable use. Free Up IT Resources. Office IT teams typically have their hands full, dealing with printer maintenance and repair. It makes it impossible for them to focus on strategic, higher-impact efforts like software engineering or API development. Managed print services take print responsibility off the IT team’s shoulders. Enable Accessible Customization. By investing in managed print solutions, offices can leverage their technology in new ways. Customizable workflow solutions can use print data to inform other processes and eliminate inefficiencies in the corporate environment. Improve Scalability. One of the most valuable benefits copier dealers offer through managed print solutions is the ability to scale print infrastructure up or down without having to invest in additional equipment. Offices simply pay for the amount of print service they actually use. The first step towards implementing a managed print infrastructure is contacting an expert print vendor and ordering a comprehensive print audit. The print audit process consists of the copier dealer setting up small software monitoring systems on the office’s print fleet and capturing print data as it comes in over a period of time. When the data is ready, the managed print vendor’s technicians can analyze it to identify opportunities for greater efficiency. These opportunities can include new software, new hardware, or the redistribution of an existing print fleet. For example, the data usually finds a few individual users guilty of overusing company print assets – sometimes for personal use. Ultimately, the managed service provider may choose to implement software monitoring and print tracking software such as PaperCut. This technology lets print asset owners see, address, and restrict print usage at the individual user level. There are more managed services available than just managed print. Offices need expert help with workflow optimization and scalable asset infrastructure along a broad range of lines. For example, managed network services operate in a similar way to managed print. Organizations can use managed network solutions to gain access to scalable network infrastructure at a far lower cost than in-house equipment. This reduces the need to purchase and maintain expensive network routing equipment while ensuring that the office’s in-house IT team remains relatively unburdened. With a managed network solution in place, IT technicians can focus on optimizing workflow solutions for employees and reaching out to customers more effectively. Workflow optimization and process development are part and parcel to the overall productivity boost that copier dealers offer. Managed network and print solutions allow businesses to effectively sidestep some of the most challenging and expensive concerns associated with operating a modern enterprise. Cybersecurity is also part of the managed services package. Since service vendors focus exclusively on maintaining and developing their services, they are able to dedicate more resources to keeping their systems secure and free from data breach vulnerabilities. Instead of simply purchasing equipment from a copier dealer like Zeno Office Solutions, have our team of highly knowledgeable professionals develop a plan that boosts the productivity of office workflows. Our team is ready to put the latest technology to work helping office managers achieve more and spend less. Is your office ready to cut costs and improve efficiency with state-of-the-art software and expertise? Talk to Zeno today and find out how we can help! As a proud Xerox company, we are positioned as one of the largest and most respected technology and document management partners in the State of Florida. We write about process automation, sustainability, and making your business smarter, faster and more efficient.